Belogolovsky, V. (2009). GREEN HOUSE. Yekaterinburg: Tatlin. International, 38 “Canyon” in the center of Osaka (2014). The Jerde Partnership, 3. Day, C. (1994). Mesta, gde obitaet dusha [Places of the soul]. Moscow: Ladya. De Garrido, L. (2011). Sustainable architecture Green and Green. Barcelona. Engelhard, A. Colararchitectur im Industrie- und Verwaltungsbau in Gesundes Bauen und Wohnen. 1/90 march, 38. Р. 38. Logvinov, V. N. (2007). Zhiloi dom i administrativno-delovoi tsentr na Karamyshevskoi naberezhnoi [A residential building and an administrative and business center on Karamyshevskaya embankment]. Tekhnologia stroitelstva (special ed.). Kachestvennaya arkhitektura. praktika, priemy i printsipy [Architecture integrated with nature: practice, techniques and principles]. Arkhitektura i priroda. Priroda i arkhitektura. Moscow. Logvinov, V. N. (2011). Pavilion yacht-kluba “Kantri-Park-Klab” v g. Khimki [Pavilion for Yacht Club “Country-Park-Club” in Khimki]. Tekhnologia stroitelstva (special ed.). Kachestvennaya arkhitektura. Logvinov, V. N. (2012). MFK “Staryi gorod’ v Khimkakh v kontekste evolyutsii torgovo-obshchestvennykh kompleksov [Multifunctional Complex “Old City” in Khimki in the context of evolution of trade and public complexes]. Arkh. Vestnik, 2 (125). Panasenko, S. (2016, February 3). Luigi Fiumara: “V tsentre arkhitektury dolzhny byt’ ne kilovatty, a chelovek s ego samooshchushcheniem v okruzhayushchei srede” [Luigi Fiumara: “Architecture should be focused not on kilovattes, but on human beings with their personal self-perception in the environment]. Retrieved from: http://green-city.su/arxitector-luidzhi-fyumara. Savkin, K. (2010). Novoe Siti proto-goroda. Razvitie delovogo tsentra Kantri Park v Khimkakh [A new City for a proto-city. Development of the business center Country Park in Khimki. Arkh. Vestnik, 6 (117), 87–93. LOGVINOV, Victor. 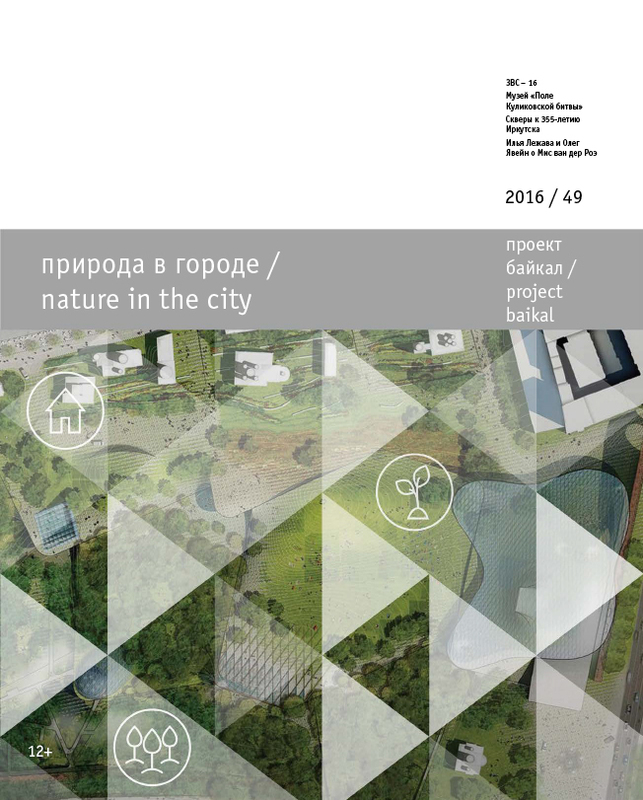 From “Green Building” to Architecture Integrated with Nature: Regeneration principle. project baikal, Russian Federation, n. 49, p. 60-71, aug. 2016. ISSN 2309-3072. Available at: <http://projectbaikal.com/index.php/pb/article/view/1051>. Date accessed: 23 apr. 2019. doi: https://doi.org/10.7480/projectbaikal.49.1051.